Finish in distressed French oak and constructed to a high standard and dovetail drawer fronts. This french style rustic oak range is an exquisite collection at affordable prices. Fully assembled. Dimensions H64cm x W53cm x D40cm (Delivered within 2-4 weeks). Modern grey gloss fronts with light oak effect cabinet. Manufactured from composite board and plastic veneer. Metal drawer runners, metal handles. Self Assembly. Dimensions H61cm x W40cm x D40cm (Delivered within 2-4 weeks). Ex-display Clearance Item. 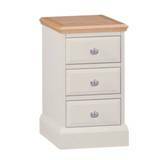 Cream Finish, Dovetail drawer fronts with stylish nickle cup handles. Fully assembled. Dimensions H60cm x W40cm x D35cm (Delivered within 3-6 weeks). 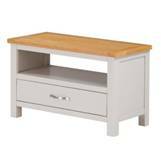 Annecy 2 Drawer Narrow Bedside by Corndell. Fully assembled. Dimensions H53.5cm x W38.5cm x D42.5cm (Delivered within 6-8 weeks). 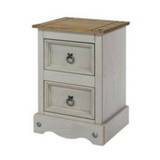 Annecy 2 Drawer Bedside Cabinet by Corndell. Fully assembled. 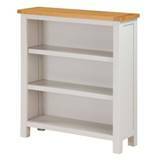 Dimensions H61cm x W53cm x D42.5cm (Delivered within 6-8 weeks). Manufactured by Corndell. Fully assembled. Dimensions H54cm x W44cm x D43cm. (Delivered within 4-8 weeks). Manufactured by Corndell. Fully assembled. Dimensions H74cm x W44cm x D43cm. (Delivered within 4-8 weeks). New Quercus Bedside 1 Drawer 1 Door. Dimensions: H 25.5" x W 17.5" x D 15.75". 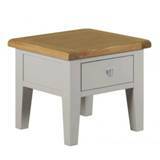 New Quercus Bedside 3 Drawer.